An occasional treat, at the weekend or when on holiday for most people or even a quick to prepare main meal at any time of the day. A version of the "Full English Breakfast", by this title or one of the regional variations, will almost certainly be available at breakfast wherever your overnight stay is in the UK and at any price point. It will also be on the menu at many small cafes and even in some pubs, it may be called an "All Day Breakfast" available into the afternoon. This is a meal that is as flexible as you want to make it, there are some core ingredients though even those are optional, and a range of others that are variable, including by region. It is somewhat unusual as a dish in that each ingredient is cooked individually and then served together which aids the pick-and-mix approach to choosing exactly what you want. The ingredients are mostly either fried or grilled (broiled), if cooked at home, generally a combination of the two if you run out of frying-pan space. If ordered as a meal, you will usually be offered a full choice over exactly what ingredients you want. It will always be offered with tea and is best served with tea which cuts through the fat of some ingredients and prepares your palate for the next taste sensation, coffee is just wrong, but we won't think ill of you if you prefer it. Subtle it isn't, but it is enormously satisfying. One of many versions of the Full English Breakfast - clockwise from top, black pudding, bacon, fried eggs on toast, sausages, fried tomatoes. There should always be bacon or sausages, preferably both, but either will do alone if you are short of the other or not so keen, there should also be eggs and bread of some sort. Beyond that it is a matter of personal preference, though I would suggest some degree of restraint, it is all too easy to pile absolutely everything onto your plate and end up feeling you over did it. One of my favourite versions is two or three excellent local sausages, 2 fried eggs, toast and tea. There are many strongly held opinions on what does and doesn't belong on the plate. The key to the best fry up is in the quality of the ingredients. As they are eaten individually with little else to detract from their own qualities, there is nowhere for second rate ingredients to hide. Locally sourced is best, they will be produced in smaller quantities and the fact they are not being transported large distances means that they are good enough for the people who live nearby to buy all of the production. So rather than trying to source chef recommendations (that will be local to that chef) look out for breakfast menus that make a point of featuring the produce near to where you are. In Britain bacon usually means "back bacon" which is made from pork loin. "Streaky bacon" made from pork belly is also available to buy at butchers and supermarkets (this is more like what Americans know as bacon). If you are eating your fry up in a cafe or as breakfast after a nights accommodation it will almost always be back bacon that is served, it is less fatty than streaky bacon. British sausages are quite thick and meaty usually being made with coarsely ground pork and are relatively preservative free compared to other sausage styles with a short shelf life as a result. Locally sourced will be best. Be aware that there are descriptors that are of the style rather than the source. 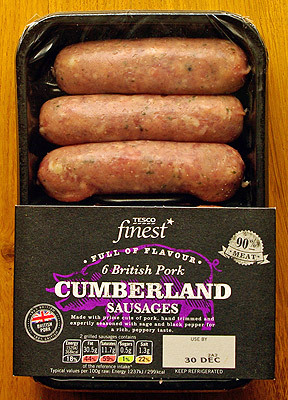 "Cumberland" sausages are popular but except in Cumberland itself (in the NW of England) they probably won't come from there, likewise "Lincolnshire" describes sausages are herby rather than their county of origin. 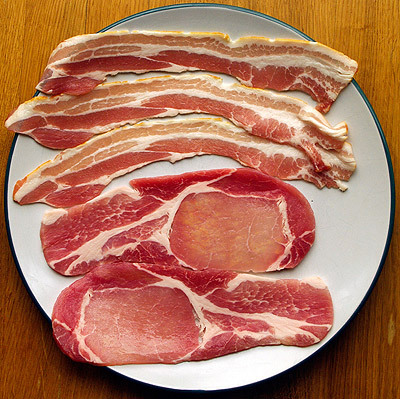 Uncooked bacon - streaky bacon at the top, back bacon at the bottom Back bacon is made from pork loin, streaky from the belly, this streaky is smoked which gives the yellow-brown colouration to the edge. Uncooked Cumberland Sausages - a style of sausage rather than being where they were made. Eggs are the one absolutely essential ingredient. They can be prepared in a number of ways, fried being most common and traditional, though scrambled or poached are popular too. Asking for "over easy" or "sunny side up" will most likely meet with a blank stare. A British fried egg is more like what is known as sunny side up elsewhere, though it may often have had a lid placed over the pan for a short time or have been basted with hot oil to cook the thin layer of white on the egg without cooking the yolk. Cook over a high heat to get those brown crispy edges, or a low heat to avoid them. 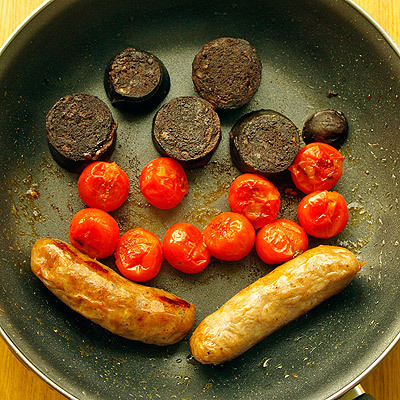 Black pudding, cherry tomatoes and sausages - almost anything can share the pan, take ingredients off direct heat and place under a grill or oven at low heat to keep them warm and stop overcooking. 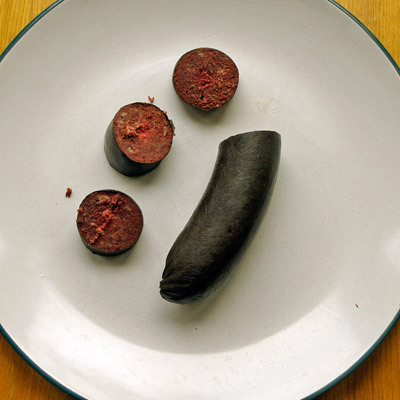 Uncooked black Pudding - bought as a sausage of varying diameters, slice thickly and don't cook much. A blood sausage, fried or grilled and served as a 1-3 thick slices, regarded by many as a delicacy and a highlight in a fry-up. If you are familiar with the various intensely savoury sausages that are found across Europe and much of Asia and have tried and enjoyed them, then you will be a fan of black pudding. To some people however, the very concept of a blood sausage can cause an attack of the vapours, be bold, try it, it's fab. White pudding may also be on offer if you are in or near Scotland, this is similar (oatmeal, fat, onion, spices) but without the blood. These are tinned haricot beans cooked in a tomato sauce, (cooked by steaming and not baked at all) they are quite different to anything with a similar name elsewhere in the world, they have a savoury sweet flavour and the beans are soft. Their presence in a fry-up is to provide a different texture and a non-fatty contrast to the meaty ingredients. They aren't especially delicious on their own, but are the perfect foil to many other things on the plate, they should be added fairly sparingly and used almost as a condiment. The uninitiated will often add too many and then are put off by feeling obliged to consume the excess on the plate when everything else has gone. Heinz are the most popular brand, there are others available. Instead of or as well as a spoonful of beans and fulfilling the same function. I prefer one or the other, tomatoes or beans, the two together is a step too far. Fried or grilled if fresh, microwaved or heated in a saucepan if tinned, as with beans, don't go overboard. A single massive big one if you're a poncy chef, sliced if you're not and preferably fried in the pan to soak up all the tasty juices that ran out of the other ingredients. Fried potatoes of some kind frequently put in an appearance. The simplest version and best (imho) are sautéed, fried slices of par-boiled potato. Hash browns are unaccountably popular particularly as they are are often factory made and cooked from frozen (please do not sully your palate gentle reader), freshly made ones are a different beast though uncommonly found. There are regional variations such as potato farls in all parts of Ireland, tattie scones in Scotland, potato cakes and any number of others. When cooked at home, left overs from the previous day are the easiest way of including potatoes. Personally I don't think a breakfast plate is any place for a sensible minded potato, though I do accept this is not a universal opinion. Usually toasted as one of its myriad forms and supplied with butter or a low fat spread, plain bread slices or rolls will also be an available alternative, soda bread or sourdough may appear. Another option is fried bread. This is very much an occasional treat in the fry-up and can be quite a delicious revelation if you have never had it. 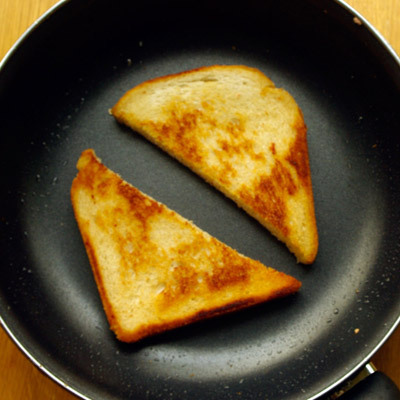 It is simply a slice or half a slice of bread fried in the pan after the bacon and sausages have been cooked where it soaks up the fat that has come out until it becomes crispy on the outside, delicious but probably not so healthy. The essential accompaniment - in a mug with preferably another to follow. The tannins cut through the fat and are an excellent in-meal palate cleanser, the flavour of coffee just competes and not in a good way. Enjoy! The ultimate mix and match meal. Brown or red sauce (tomato ketchup) are favoured by some as an accompaniment though not by me. 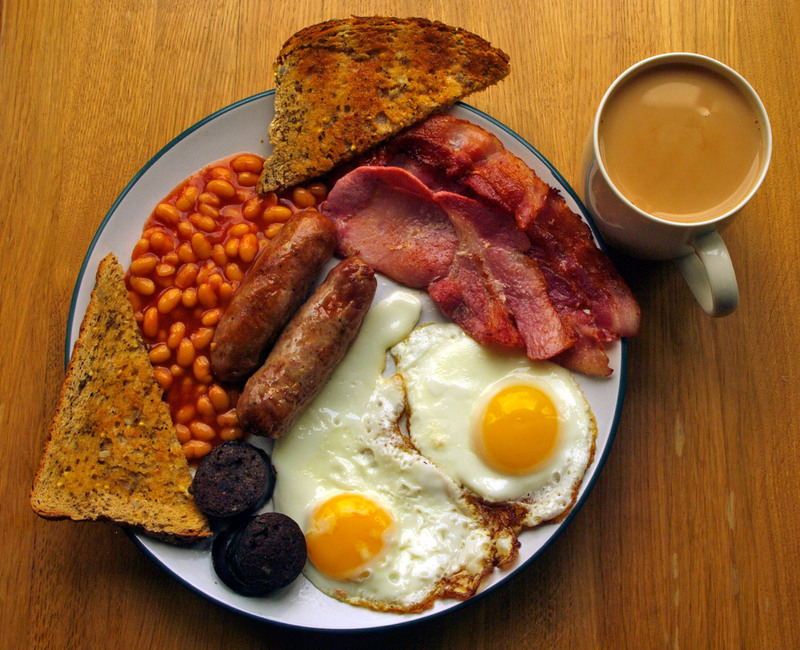 There are a great many other regional ingredients that you might find as part of a fry-up. They are usually similar to those listed above, some kind of sausage or bread/potato/oatcake variant, too numerous and irregularly found to mention here. Some are quite different, in Wales for instance you may encounter laverbread made from seaweed and oats, in Scotland you may be served fruit pudding made with sugar and dried fruit. In assorted coastal venues fish and/or shellfish may put in an appearance, though this is now straying from the traditional core fry-up quite significantly. Lay out the ingredients you want before you are ready to start - there is little preparation needed, but they do take different amounts of time and should be cooked in the right sequence so they are all ready together. A second frying pan makes life easier, the grill can be used for cooking or keeping things warm if they are ready too early or if you are short on frying pan room (or use the oven on at about 120C). It's about timing and co-ordination - juggling rather than cooking skill. If you're a beginner use a lowish heat so you can get the timings right. Sausages - these take the longest to cook and so are put on first on a low to medium heat in a frying pan or under the grill. Potatoes - take a similar amount of time as the sausages so start them early on if you are doing them. Bacon - put on when the sausages are half done. Fresh tomatoes - take longer than you think, put them in the pan with the sausages if they are very large, or the bacon if they are smaller. 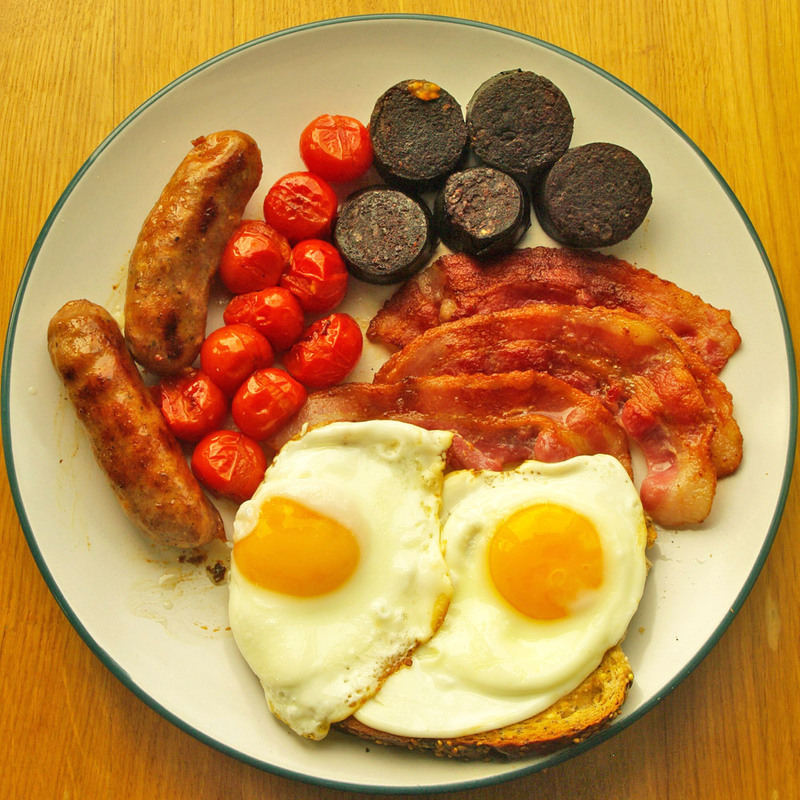 Black pudding - takes less time than the bacon, take care not to dry it out. Put the kettle on for the tea - most important. Eggs - start frying them. 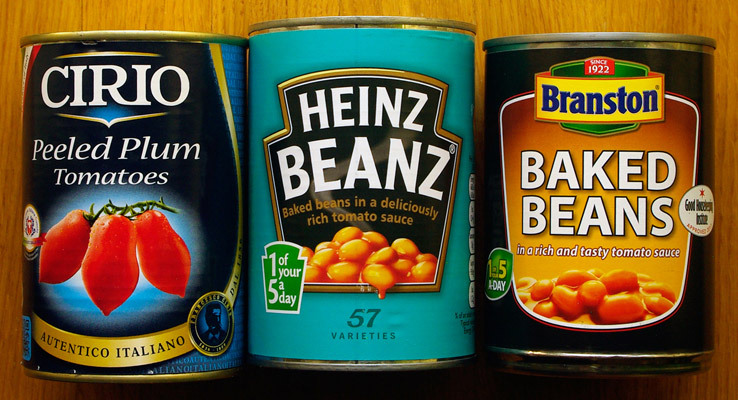 Beans or tinned tomatoes - in the microwave or start to heat them up in a small saucepan. Toast - put bread in the toaster. Mushrooms and/or fried bread - When there's room in the frying pan, put these on a high heat while you butter the toast, make the tea and assemble the rest of the ingredients on the plate. If you're alone, make extravagant slurping noises with the tea and satisfied grunts when you get the perfect combination of two flavours of the fork together - or maybe that's just me.